After proclaiming the Declaration of Independence of India on January 26, 1930, Mahatma Gandhi came to an impasse in his political career focused on freeing India from British rule. A new anti-government campaign was imperative for achieving the secularization of India; it remained unclear, however, to Gandhi what form was most appropriate for this campaign to take (Sheean 152; 156-7). During the period that followed in which he could find “no light at the end of the tunnel,” it became apparent to Gandhi that non-violent civil disobedience would form the basis for any ensuing protest (Sheean 152; 156-7). Beginning in February 1930, Gandhi’s thoughts swayed towards the British salt tax, one of many economic improprieties used to generate revenue to support British rule, as the focal point of non-violent political protest (Ashe 301). The British monopoly on the salt tax in India dictated that the sale or production of salt by anyone but the British government was a criminal offense punishable by law (Ashe 301). More so than in more temperate climates, salt was invaluable to the people of India, many of whom were agricultural laborers and required the mineral for metabolism in environments of immense heat and humidity. Occurring throughout low-lying coastal zones of India, salt was readily accessible to laborers who were instead forced to pay money for a mineral which they could easily collect themselves for free (Jack 235). Moreover, Gandhi’s choice met the important criterion of appealing across regional, class, and ethnic boundaries. Everyone needed salt, and the British taxes on it had an impact on all of India (see The Sepoy Mutiny, African American Studies and Postcolonialism, Apartheid). Truth (Satya) implies Love, and Firmness (Agraha) engenders and therefore serves as a synonym for force … that is to say, the Force which is born of Truth and Love or Non-violence… [If] we are Satyagrahis and offer Satyagraha, believing ourselves to be strong … we grow stronger and stronger everyday.With our increase in strength, our Stayagraha too becomes more effective, and we would never be casting about for an opportunity to give it up (Gandhi 87). Judith Brown (1977) considers the choice of the salt tax as an strategic protest point ingenious because every peasant and every aristocrat understood the necessity of salt in everyday life (Copley46-8). The choice also did not alienate Congress moderates and was simultaneously an issue of enough importance to mobilize a mass following (Copley 46-8). If my letter makes no appeal to your heart, on the eleventh day of this month I shall proceed with such co-workers of the Ashram as I can take, to disregard the provisions of the Salt Laws. I regard this tax to be the most iniquitous of all from the poor man’s standpoint. As the Independence movement is essentially for the poorest in the land, the beginning will be made with this evil. On March 12, 1930, Gandhi and approximately 78 male satyagrahis set out, on foot, for the coastal village of Dandi some 240 miles from their starting point in Sabarmati, a journey which was to last 23 days (Jack 237). Virtually every resident of each city along this journey watched the great procession, which was at least two miles in length (Jack 237). On April 6th he picked up a lump of mud and salt (some say just a pinch, some say just a grain) and boiled it in seawater to make the commodity which no Indian could legally produce — salt (Jack 240). He implored his thousands of followers to begin to make salt wherever, along the seashore, “was most convenient and comfortable” to them. A “war” on the salt tax was to be continued during the National Week, that is, up to the thirteenth of April. There was also simultaneous boycotts of cloth and khaddar. Salt was sold, illegally, all over the seacoast of India. A pinch of salt from Gandhi himself sold for 1,600 rupees, perhaps $750 dollars at the time. In reaction to this, the British government had incarcerated over sixty thousand people at the end of the month (Jack 240-3; all of last paragraph). On the night of May, 4 Gandhi was sleeping in a cot under a mango tree, at a village near Dandi. Several ashramites slept near him. Soon after midnight the District Magistrate of Surat drove up with two Indian officers and thirty heavily-armed constables. He woke Gandhi by shining a torch in his face, and arrested him under a regulation of 1827. The effects of the salt march were felt across India. Thousands of people made salt, or bought illegal salt. 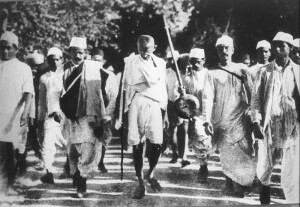 This period is to be considered the apex of Gandhi’s political appeal, as the march mobilized many new followers from all of Indian society and the march came to the world’s attention. After Gandhi’s release from prison he continued to work towards Indian independence, which was achieved in August, 1947. Dandi was a key turning point in that struggle. Ashe, Geoffrey. Gandhi: A Study In Revolution. London: Heineman Ltd., 1968. Copley, Anthony. Gandhi: Against the Tide. Oxford: Basil Blackwell Ltd., 1987. Gandhi, Mohandas K. “Victory in South Africa.” The Essential Gandhi. Ed. Louis Fischer. New York: Vintage, 1962. 84-111. Jack, Homer A. The Gandhi Reader: A Source Book of His Life and Writings. Bloomington: Indiana University Press, 1956. Sheean, Vincent. Mahatma Gandhi: A Great Life In Brief. New York: A. Knopf, Inc., 1955. Adams, Jad. Gandhi: The True Man Behind India. New York: Pegasus Books, 2011. Dāsa, Ratana. The Global Vision of Mahatma Gandhi. New Delhi: Sarup & Sons, 2005. Gandhi, Rajmohan. Gandhi: the man, his people, and the empire. Berkeley: University of California Press, 2008. Kuhn, Betsy. 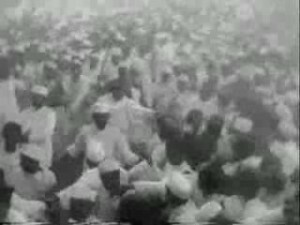 The Force Born of Truth: Mohandas Gandhi and the Salt March, India, 1930. Chicago: Twenty-First Centyr Books, 2011. Webster, Thomas. 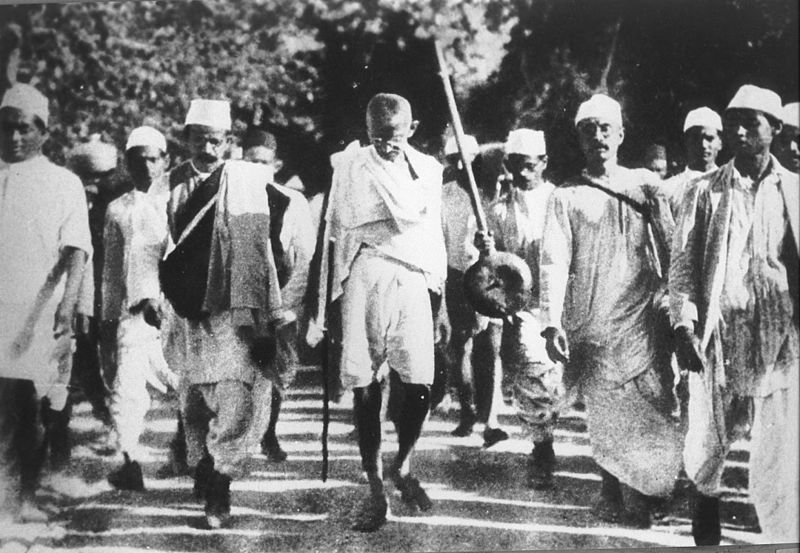 On the Salt March: the historiography of Gandhi’s march to Dandi. New Dehli: Harper Collins Publisher India, 1997. Author: Scott Graham, Spring 1998. Hi, I think the following link will be useful for information on important events in Gandhi’s life.